In 2008 the U.S. Department of Labor’s Occupational Safety & Health Administration (OSHA) re-issued its National Emphasis Program directive emphasizing the hazards of combustible dust and the need for safety for facilities that handle these dusts. A major component of this directive is the protection of enclosures, like dust collectors, in the event of a dust explosion. As a distributor for Fike, we can help you select the correct solution to help mitigate the hazards associated with a combustible dust event. 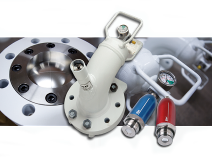 These options include: explosion relief vents, explosion suppression and isolation canisters, flameless vents, explosion isolation valves, with the correct choice dependent upon on your product and application.